Here’s a problem which came to a head when I spent half of last night’s (very enjoyable) episode of Doctor Who thinking that Keeley Hawes’ character was the same as the recurring ‘Missy’ we have been introduced to, who is actually played by Michelle Gomez, a completely different person. A silly mistake? I know Doctor Who isn’t mine any more, but it’s fair to say I still take more than a casual interest, so I refuse to believe I was the only person who had this problem. Okay, I was tired, and it has been a few weeks since we saw Missy – but I don’t merely put my confusion down to the fact that they have been given a sort of similar physical resemblance (power-dressed in black, power hairstyles piled and pinned, power make-up heavily applied, power cheekbones – go on, I dare you to deny that they’re more than passingly similar…). No, what cemented my confusion was the fact that they have both been written with the same character. You know the one: everso sophisticated, polite yet snarky restraint, schoolmarmish and very emancipated. In fact, in describing this villainess-by-numbers, I realise that we’ve seen it in previous episodes of Doctor Who: I’m thinking of Miss Foster, Miss Kislet and Madame Kovarian. It is becoming pretty obvious what kind of woman Doctor Who writers are terrified by. All of them fine actresses delivering fine performances, by the way – just delivering fine performances of the same character. 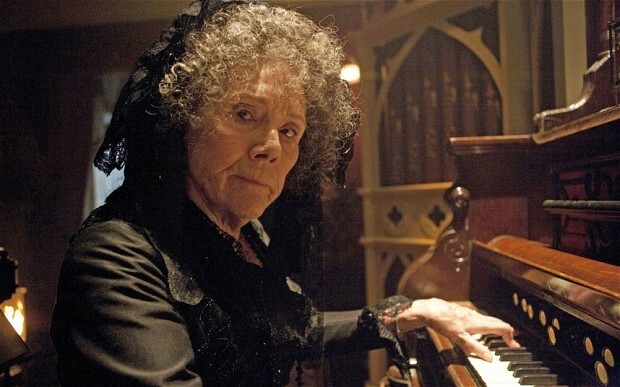 The only substantial female villain in recent years who doesn’t fit the template is Diana Rigg’s magnificent Mrs Gillyflower, but that episode, The Crimson Horror, was atypical in virtually every way, a darkly comic Victorian runaround that had as much in common with The League of Gentleman (hardly coincidentally, also Mark Gatiss’ finest script for the show). Rigg’s tour de force breathed life into a caricature that might have been played by Gatiss himself in a different context: surely Doctor Who doesn’t need to be doing madcap steampunk absurdism to earn an interesting villainess? There isn’t the slightest possibility that the rich tapestry of male villains on Doctor Who could ever be confused. But for whatever reason, the series seems to be stuck with a very singular approach to women. Maybe it’s Freudian. Why aren’t the female writers doing a better job writing female villains, you ask? Ha. Only one woman has written for the series since its return. One. Count ’em. (Count ‘er, I mean.) One. She was already working on Who as a script editor, so she already had a way in for her two stories. It may be irrelevant, but they were both stinkers anyway. That’s the kind of brilliant female writing talent the production team should be actively seeking – specifically female, because a) the series plays an aspirational role in the lives of young boys and girls, and b) because it is clearly lacking a dimension which female writers would undoubtedly bring with them. Before we have another silly debate about whether the next Doctor should be played by a woman, there are far more pressing gender issues the programme needs to address. Oh, and late 80s Doctor Who, on just four stories a season, had brilliant female villains.